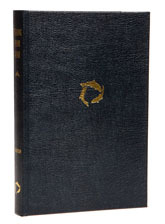 Printed as a limited edition of 150 copies by the Flyfisher's Classic Library, this is a reprint of Johnson’s minor classic, which has the distinction of being one of the few books on fishing to be written in a prisoner of war camp. Johnson was shot down in 1942 and whiled away his imprisonment by committing to paper his memories of the Tweed and Till; the Eden and the Eamont; and particularly, Camasunary. Much of the charm of the work lies in the author’s undisguised pleasure at his recollections, which transported him far away from the cramped conditions and harsh regime he was experiencing in Stalag Luft III. He was lucky to be there – though the Mosquito he flew had a very low attrition rate, few crews survived being shot down in one and I have always wondered if this lay at the back of Johnson’s mind as he scribbled down the thoughts which might so easily have burned with him. I first read this book long ago and I was going to review it on that basis, but something made me turn to chapter one and I stayed put until I had finished. There is no doubt that this is an immensely charming work and it would make a particularly good Christmas present. Quite why some books qualify for winter reading, I have no idea, but this is definitely one of them and though it by no means stands in the first rank, the literature would be much the poorer without it. This edition is now out of print and Johnson's book is available in other, cheaper editions if you search through the usual places. Paradoxically, first editions in good condition often cost less than the FFCL edition did when it was published, but if you collect FFCL editions, this volume is well up to the usual standard than Justin Knowles set for the original series.